Android. It’s been around for more than five years, and there’s nothing more natural than seeing it on a smartphone or a tablet. But would you expect to see it in your fridge? Not so much. And yet, if you really look (as we just did), you’ll find Android installed on all sorts of weird devices. Prepare to be perplexed. You heard right. The Dacor Discovery IQ [Broken Link Removed] is an oven running Android, and it’s not even that new (although it was updated this last CES). According to Dacor’s website, the oven is powered by a Samsung 1 GHz processor and 512 MB DDR2 RAM, has a Wi-Fi connection, a 7-inch LCD touch panel, and stereo speakers. Perfect for that cooking music you can’t do without, I guess. It also lets you control the oven remotely using the Dacor app and your phone (iOS is supported too!). The Dacor Discovery IQ comes in three different models, the most affordable of which will still cost you $4500. The most expensive one is no less than $12,000. Phew. Got $3500 to spare? You too can have Android inside your fridge. This Samsung fridge has four doors, with an 8-inch LCD display built into one of them. Not only can you use it to display photos, write notes, find recipes and access your calendar, it also comes with “special apps made for your refrigerator”. I’m assuming this means stuff like custom shopping lists and inventory organizers. At least I hope that’s what it means. The fridge also has a Wi-Fi connection, so you can even get weather updates right on your fridge. Perfect for when you’re getting that glass of water in the morning. Android-based gaming consoles are not that new anymore, and therefore they might not seem that weird. But when you think about it, it’s a pretty unusual place to find Android. The most famous Android consoles are the OUYA and GameStick, and both are pretty affordable ($99.99 and $79.99, respectively). Android-based consoles are portable and cheap, but that doesn’t mean they’re any good. If you’re on the fence, you should read our overview of these consoles Are Home Android Game Consoles Worth Buying? Are Home Android Game Consoles Worth Buying? Several Android game consoles were announced as a revolutionary alternative. No longer would platforms be closed and heavily guarded – instead, developers could upload their games with minimal fuss! Or, at least, that was the... Read More and whether they’re worth it or not. Regardless, these consoles are not going anywhere, and we’ll probably see more of them in the future. Unlike Android-powered ovens, this is probably here to stay. You’ve probably heard of Google’s announcement in this year’s CES about Android and cars. In short, Google wants to bring Android-powered dashboards to lots of cars, pretty soon. But this is not some imaginary future. Android-powered in-car entertainment systems already exist. They’re made by Ca-Fi, and you can install one in your own car, or find a car that already has one installed. What can you do with it? Stuff like hand-free calls, navigation, listening to music, and even downloading regular Android apps. Will this make driving more or less safe? I’m not exactly sure, but it does seem like something we’ll see a lot more of in the near future. Being the best example of weird Android usage of the lot, I was sad to discover you can’t actually buy this washer/dryer yet. In fact, I couldn’t find out whether it will ever be available at all. This Touch Revolution washer/dryer was presented at CES several years ago, and I can only hope it’s still being worked on, as it’s brilliant. The Android-based touch panel gets rid of all washing-machine question marks. Tell it the kind of fabric you’re washing or the kind of stain you’re trying to remove, and it automatically inputs all the right settings for you. It can send you a text message when it’s done washing, and in general, it’s just much better than all those inexplicable symbols and buttons no one ever knows how to use. Touch Revolution doesn’t actually make the washer itself, only the Android-powered control system (it also makes a similar product for microwaves), so it’s now up to third-party companies to integrate it with their appliances. I did manage to find a washing machine made by Samsung which seems to incorporate Android, but the “learn more” link leads to a non-existing page. This Zipwhip-powered coffee machine is probably the coolest use of Android I’ve ever seen. While you can’t exactly buy this awesome thing for your home or office, it definitely exists in real life. Zipwhip is a text-messaging company, and is one of many ways to send out free SMS messages The Best Ways To Send A Free SMS Online The Best Ways To Send A Free SMS Online In an era where smartphone ownership is becoming the majority, it’s hard to imagine someone who can’t (or won’t) send out text messages. When was the last time you knew someone who didn’t have a... Read More . But who needs plain old text messages when you can text your coffee machine to make you a cup of coffee? Another Android-powered coffee machine is this design concept by In-oh Yoo & Bong-yup Song. It combines coffee, music and Android to create what could be an interesting entertainment experience. The coffee capsules come with QR codes which the machine reads, and plays fitting music accordingly. It can also charge your phone and communicate with it to recognize you and save your coffee preferences. Interesting. To be honest, these are not the only places where you can find Android (other than tablets and phones). Android is now on cameras such as the Samsung Galaxy Camera (our review Samsung Galaxy Camera Review and Giveaway Samsung Galaxy Camera Review and Giveaway If you love your smartphone's camera, and want to take things up a notch, the Galaxy Camera is perfect for you. Running Android 4.1.1 (Jelly Bean), the Galaxy Camera is the exact opposite of what... Read More ), the Nikon CoolPix S800c, and others. It’s also on Android computer sticks What Is An Android Stick Computer, And How Can You Use It? What Is An Android Stick Computer, And How Can You Use It? Miniaturization has been a computing trend for decades, but it seems to have accelerated over the past five years. Even Intel’s NUC (Next Unit of Computing), a hockey-puck sized PC, looks large compared to ARM... Read More and Android TV sticks Google Chromecast vs. Android TV Stick - Which Should You Buy? Google Chromecast vs. Android TV Stick - Which Should You Buy? What exactly is the difference between a Google Chromecast and a generic Android Mini PC stick? Read More which are getting increasingly popular. In short, Android is slowly taking over the world. Or, wait, maybe it’s actually Google. What’s the weirdest usage of Android you’ve ever seen? I'll take pure Linux without the Googleness of Android, please. 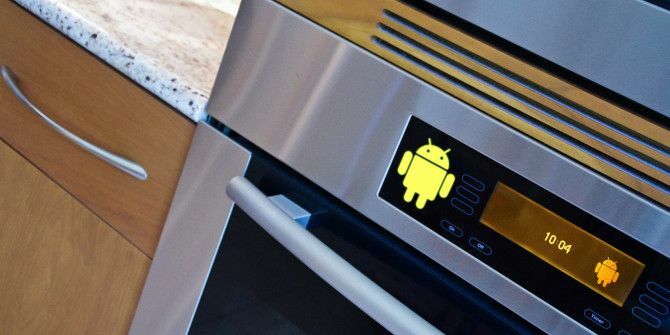 So android in appliances. Now hackers can hack your oven, fridge, laundry equipment and cars. GrEaT!¡! Just another example over manufacturers going with the cheapest possible solution then Inflating the prices to redicolus levels instead of investing in secure, proven tech. Interesting article, but I see these as little more than gimmicks – particularly the Samsung fridge. I can just imagine how woefully inadequate the apps are (after all, how many people will actually buy one of these – and why would Samsung ever update/make new apps/make old apps actually work?). If I'm going to spend $3500 on a fridge I'd rather get the $3000 model and a separate tablet for around the house. Also a future where everyone's driving around with apps on their dashboard, Tweeting and searching Google with reckless abandon is a terrifying one. It reminds me of the old joke, that if Microsoft made cars you'd need to reboot them every so often. For no reason at all, your car would crash twice a day. Occasionally, executing a manoeuver such as a left-turn would cause your car to shut down and refuse to restart, and you would have to reinstall the engine. Only one person at a time could use the car, unless you bought 'Car95' or 'CarNT', and then added more seats. Apple would make a car powered by the sun, reliable, five times as fast, and twice as easy to drive, but would run on only five per cent of the roads. The airbag would say 'Are you sure?' before going off. ...and an Android coffee-maker, because that thing is cool! I'd love the coffee maker! The fridge is appealing too. I'm glad to see Android coming to cars. Too many auto manufactures are going with iOS. Forget Apple and go with Android. It looks like Android is slowly taking the place of embedded Java, which makes sense because Android apps are built using Java. Not all Android apps use Java; many apps (games, for example) are built using native code for speed. Or maybe make the oven burn your food! @Howard B The typical uses for embedded Java, such as listed above, probably wouldn't benefit from native code. At least according to the Android documentation anyway. Sure are a lot of biased opinions up in here. The whole "JAVA IS INSECURE" bias comes from people using the browser plugin which has very little by way of security despite the fact that it warns you twenty times consecutively that you are about to run a Java applet. Android is a solution, but it isn't THE solution... It has its fair share of problems, too. It's best to choose the right tool for the job, and Android can fill that need in many cases, apparently.